Last year, New York-based Friendship Dairies saw big, national competitors encroaching into its home territories in Connecticut, New Jersey, New York and Pennsylvania. So to battle back the Chobanis and Daisys at the gate, the brand, a division of Saputo Dairy Foods, began crafting the Fit to Go Mobile Mixer Tour—a first-time foray into the event marketing space for the brand—and prepared to launch itself into the social media sphere as a support for the tour and a permanent home for the brand’s online fans. 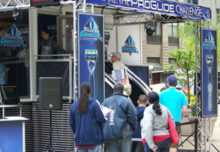 The tour, which was handled by New York City-based Grand Central Marketing, ran throughout the month of May and was designed to show off the versatility of Friendship’s cottage cheese, offer consumers some tasty recipes and differentiate the brand’s products from its competitors. The program launched May 7 with the help of celebrity chef Rocco DiSpirito, who created the Friendship Apple Pie Smoothie for the brand with 1% Low Fat Friendship Cottage Cheese. The smoothie was one of the samples available at key stops along the tour, which hit festivals, fairs, sporting and charity events through June 4. Consumers could sample Friendship’s on-the-go cottage cheeses and customize them with berries, fruit, granola and other toppings. 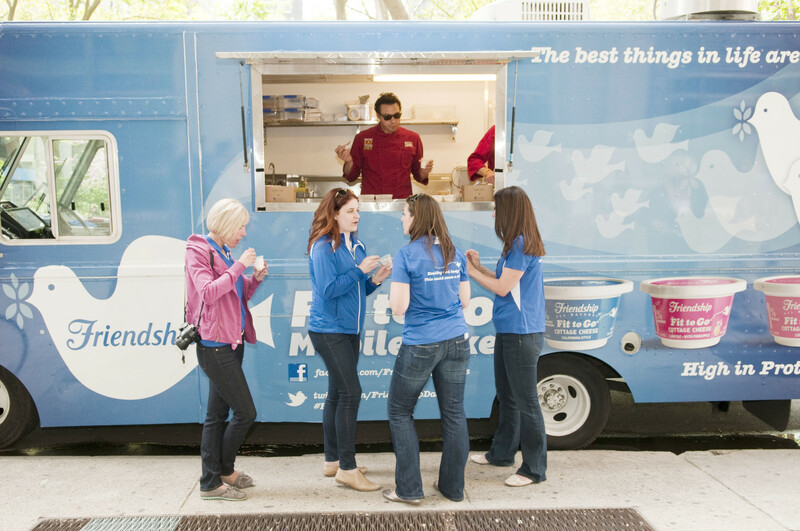 To support the tour and flex its brand-new social media muscle, the brand announced upcoming stops and posted live from events on Twitter @FriendshipDairy and on Facebook. Recipes and other takeaway information found a home on the brand’s Pinterest board. Making sure there was live posting going on during tour stops was important for Friendship, so the brand put out iPads at each event, preloaded with tabs for each social channel, and offered easy ways to get recipes and share instant feedback for the brand. The tour engaged with more than 100,000 fans, which exceeded the brand’s goals for the initiative. On the social front, most of the growth was on Facebook, where the brand has garnered more than 2,000 followers since it launched the page earlier this year. Twitter is still small, at just under 300 followers, but active. On Pinterest, some of the most interesting and exciting activity is taking place. The 110 followers of the brand’s pinboards share its recipes and pin goodies to their friends, and contribute new ideas for cottage cheesy-snacks. So, how’d they do it? EM took a look inside, with the help of Pistone and Amy Funke, manager-digital marketing at Grand Central Marketing. This is a blow-by-blow timeline of the process that led to a successful first-time event deployment and social media launch for a brand that skipped dipping a toe in and went for the cannonball instead. It began with the problem, as most solutions do. Pistone saw its competitors aggressively targeting Friendship’s markets and consumers—Daisy through price and Chobani by pushing its flavored varieties. She approached GCM, and together they sketched out the sampling-focused tour and right away saw the potential of using it as an anchor to launch a new social media initiative, too. This month was all about approvals and presentations to the stakeholders. Pistone and Funke presented the initial plan, strategic concept and goal structure to Friendship’s c-level executives, took the feedback, which was positive and invested from the get-go, and made adjustments before getting down to the nitty-gritty. Hard stuff was handled next, with budget, strategy and final tactical tweaks locked in by the end of the month. The year closed out with Friendship developing the creative elements, branding for the tour and beginning basic construction of the elements. It designed the signage and the language of the tour, decided on the product samples to focus on and took the first steps toward the physical tour’s look and feel. On the social front, the content and collateral was coming together, with banners, profile images and content all being built and designed to fit the brand’s image and support the tour. Also, the brand approached the owners of an existing consumer-built Friendship Dairy Facebook fan page and asked to take it over. Why reinvent the wheel, right? The fans that built it were overjoyed and honored that the brand liked the page enough to make it the official brand page and agreed readily to give up control. The New Year was all about building anticipation. The creative was presented internally to build excitement among the folks who would be working with it everyday, and for the decision-makers signing off on the budget. It wasn’t fully deployed yet, but there were hints. The yet un-promoted Facebook and Twitter feeds were skinned with the brand’s imagery and content. Finally, Pistone revealed the tagline and key image for the tour, an empty cottage cheese container with a spoon on a clean, cool background and a simple “Wow” underneath it. Social Media launch. The brand took formal control of the Facebook fan page, revealed its Twitter handle, hashtag and Pinterest board and started promoting them across all available marketing channels. 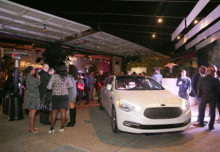 “Social was in it from the beginning, and we made it an integral part of the event and the brand,” says Pistone. The next step was to invite relevant bloggers in the foodie, organic and farming communities to visit the tours, try the cheese and promote it to their readers and fans. 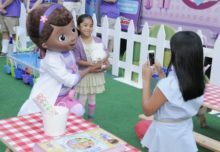 To incentivize participation, both by the bloggers and their fans, the brand set up frequent product giveaways for the bloggers to offer up. March was also the month to finalize the vehicle build and graphics wrapping, in addition to putting the final pieces in place for in-store promos that would build in-market excitement before the tour stops. The in-store sampling and promotion program began, the brand announced its partnership with Rocco DiSpirito and leveraged his social muscle to help elevate its own efforts, and secured a partnership with Bare Naked Granola to provide samples for dressing up the cottage cheese in yet another tasty, tactile way during the tour. The blogger tactics were in full swing in April, with dozens tasting, reviewing and loving Friendship’s products and encouraging readers to visit the tour dates near them. Finally, the brand made sure to secure the necessary final legal and regulatory approvals and put the required permits into place for each stop. It all comes together and runs throughout the month, to everyone’s delight and no one’s surprise.